Join us on January 4th for the kick off to our year-long lecture series. Although our series covers many topics from the Revolutionary War to the lost dairy farms of Hunterdon, we thought we would start our first lecture of the year in a very provocative way. At 1 p.m. at the Main Branch of the Hunterdon County Library on Route 12, join Marilyn Cummings to see her visual presentation on a major historical AND historic mapping project she has done for the county. She began in Delaware Township where she serves as a member of the Historical Society. She digitized and layered all of the maps she could find, from Lenni Lenape encampments to old roads. When she finished that in celebration of Delaware's 175th anniversary, she just kept going! She has now completed the digitization of all of Hunterdon. Layer upon layer of old maps have been placed on top of each other. Marilyn will peel these layers apart and demonstrate the powerful capabilities of her mapping project! After a brief break for refreshments, we shall resume with our only panel discussion of 2014. The discussion is topical: the lost and fragile historic treasures of Hunterdon. The panel will explore buildings and sites no longer there, the top ten most threatened and endangered historic structures, and how one group of intrepid citizens strove to save a major historic site and were successful in that endeavor. Panelists and historic preservation experts are Janice Armstrong, Elizabeth Cole and Michael Marguiles. A question and answer period follows. This event is free and limited to 100 people; there are 35 seats left. For tickets, please see our website; limited tickets are also available on Saturday, December 28th from 10 a.m. to 2 p.m. at the Flemington Choir School, 3 Chorister Place in Flemington. Bells will ring, musicians will play and a group of historians, former freeholders and founding family descendants will re-enact the founding of Hunterdon County. Beginning at 1 p.m. on January 1st at the Hunterdon County Historic Courthouse the Hunterdon County 300th Celebration officially kicks off. Congressman Leonard Lance will open our afternoon and then there will be a short play about the incorporation of our County. Historian Gayle Maher wrote the play after pouring over actual minutes from 18th century meetings of the Board of Chosen Freeholders. 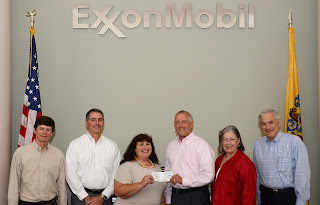 How many men behind the ruffled shirts, buckled shoes and breeches will you recognize? And pay close attention to the superb acting skills -- especially in the scene in John Ringo's Tavern - tankards and all! Immediately following the play, an amazing recital of music from 1714 and the Court of Queen Anne will commence played by the extraordinary Practitioners of Musick. And if that isn't enough for a great afternoon, Shop Rite of Hunterdon is supplying a wonderful Reception Repast AND attendees of this event will be given a special 300th gift to kick off this special year! The afternoon is free and family friendly. 225 tickets are available for this event. To acquire tickets via the internet, please visit our website www.hunterdon300th.org or tickets are available at the Flemington Choir School, 3 Chorister Place, Flemington this Saturday from 10 a.m. to 2 p.m.
you may win a prize! That's right -- Hunterdon Tricentennial Committee has announced our Photography Contest -- with CASH prizes! There are two categories: photographs of historical sites in Hunterdon and photographs taken at any official 300th event! All photographs must be taken between January 1st and October 6th, 2014. There are three age categories: students under 11; students under 17; and adults. ALL entrants must be amateurs. The contest runs until October; submissions will be taken for one week and then on display for two weeks in November. There will be a reception for all entrants and their families. Judges are the two Walters.... Walter Chandoha and Walter Chorowezski.... and Peter Sandrian. First prize is $100, second $50 and third is $50. All children entrants receive a prize. For the complete Rules and Entry Form, please see our website at www.hunterdon300th.org. The first of every month under the Events calendar has all of the links. Tickets will go on sale for the first Tavern Tour, the Frenchtown Inn, on Saturday, December 21st at the Flemington Choir School, 3 Chorister Place, Flemington. THESE TICKETS WILL NOT BE AVAILABLE VIA THE INTERNET. THE FLEMINGTON CHOIR SCHOOL IS THE ONLY PLACE THEY MAY BE ACQUIRED. There are only 40 tickets available, at $40 apiece, on a first come, first served basis. Payment is required at time of purchase. We expect them to sell out quickly. Due to high demand for this 300th event, we know there are going to be many disappointed people out there and for that, we apologize. If you don't get tickets to this event, we hope you will try for tickets in the future for the March Tavern Tour. The Hunterdon Tricentennial Headquarters at the Flemington Choir School is open every Saturday from 10 a.m. to 2 p.m.
Our Huge Year Long FREE Calendars are Here! Available now are our FREE calendars -- a true commemorative! Our calendars, designed by graphics artist Marty Campanelli, have three gorgeous reprints of her husband's watercolors showing 3 seasons of Hunterdon and most of the 180 plus scheduled events for next year. If you didn't make the connection, Marty's husband is renowned artist Dan Campanelli. Dan and Marty, both artists, researchers and historians, are and have been amazingly generous friends to the Hunterdon 300th. Our great friends at Shop Rite of Flemington and Clinton have donated the calendars to the Hunterdon Tricentennial Committee. 25,000 calendars in total have been printed. All of the information is available on our website as well. We expect these calendars to go FAST to 25,000 lucky households in Hunterdon. Just In Time For Christmas: "Hunterdon In My Heart" Has Arrived! 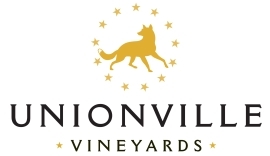 Looking for a last minute, unique gift for your Hunterdon Honey, Hubby or Houseguest? 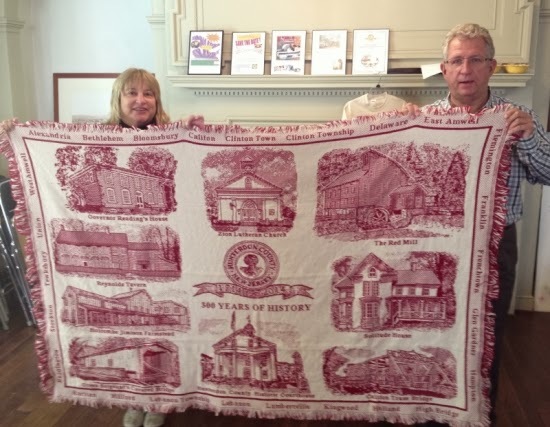 Look no more for the Hunterdon Tricentennial has added another commemorative nifty gift item to our catalog. "Hunterdon In My Heart" is a beautiful coffee table book of photographs by Walter Choroszewski. The book will be available for sale this weekend at two different book signing events. On Saturday, December 14th the book signing will take place at the Red Mill Museum in Clinton, On Sunday at the Flemington Choir School, 3 Chorister Place in Flemington. Both signings will be from 1 to 4 pm and refreshments will be available courtesy of Shop Rite. "Hunterdon In My Heart" has 330 new original color photographs capturing the essence of Hunterdon county, its special places and people. County Historian Stephanie Stevens wrote the Foreword and Congressman Leonard Lance the Introduction. During a conversation about this project, Walter Choroszewski, who has photographed and published several other books on Hunterdon County, was asked if he was from Hunterdon. He replied, "No, but I'm Hunterdon in my heart!" The books retails for $50 and will be available at the headquarters of the Hunterdon Tricentennial, The Flemington Choir School, both the North Branch and Main Branch of the County Library and various local bookstores. Our headquarters at the Flemington Choir School, 3 Chorister Place in Flemington Borough, has been busy, busy, busy during our open hours on Saturdays from 10 am to 2 pm. With the holidays here, savvy Hunterdon shoppers have been buying up commemorative items and avoiding the malls at the same time! Volunteers staffing the Choir School have been selling our 300th woven cotton throw like crazy! We just placed our first re-order so that we'll have plenty of throws for holiday gift giving. The throws are 100% cotton, made in the USA, and come in 3 colors: navy blue, a vibrant cranberry, and hunter green. They are $35 each. Other big sellers include Hunterdon Historian John Kuhl's book "Hunterdon and the Civil War" ($15), our handmade in Hunterdon sunflower bowl ($3) which is almost sold out, and our Euro-style car magnet ($10) which we have been seeing on more and more cars around our county. We also have our lapel pin ($5), t-shirts ($15 - $17) and beautiful black and white "architecture of Hunterdon" blank note cards by photographer Audrey Kerchner ($5) for sale. Don't forget to grab a 300 Fun Facts About Hunterdon County tear-off calendar for $3 (come to the companion lecture on this subject January 22nd!). Perfect for the holidays and still on pre-sale with a 20% discount is Walter Choroszewski's photography book Hunterdon in My Heart. The book sells for $40 but will be going up to it's book jacket price of $50 on December 8. Walter will be available to sign books from 1 to 4 pm on both Saturday, December 14th at the Red Mill Museum and Sunday, December 15th at The Flemington Choir School just in time for the holidays. Pre-sold orders may be picked up then and additional books will be available for purchase. Refreshments will be available at both signings courtesy of our super sponsor, Shop Rite of Hunterdon. If your office co-workers are looking for a definitive gift for your boss, or you have someone in your life with the same passion for our County as we have, a wonderful gift is Hunterdon artist Dan Campanelli's print of his watercolor "Blue Skies." This signed and numbered, limited edition print of the Hunterdon County Historic Courthouse comes both framed ($395) and unframed ($195). The print is limited to only 300 and is going to be deed restricted for 100 years until the 400th celebration. 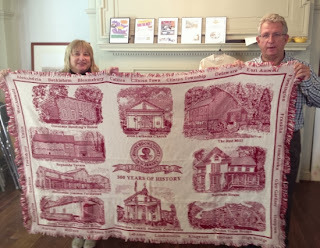 You can check out all of the items on our website www.hunterdon300th.org or just stop by any Saturday between 10 a.m. and 2 p.m.